I say sack Edgar. He clearly doesn’t have a nose for a story. Or the teeth for it. Loving the Meadowlarks! I’m going to tell Edgar that you are sending him your best regards! Yep, quite see how these would make you shuffle. Love ’em. Thanks for both the cautionary tale – I’ll definitely be putting in an extra few minutes scrub-time on them from now on – and for expanding my musical range. I particularly like Cab Calloway. Cab was cool. His most famous song, maybe, was Minnie The Moocher. Of course, should have guessed. Love that song. My grandma had the Minnie the Moocher record. Don’t know what happened to it. Will have to download the other and listen while I floss. Not a regular flosser, unfortunately. Need to work on that. My dad has some teeth issues in the 70s, he liked his candy and probably rarely brushed. He had a lot of decay, though not unmanageable. His genius of a dentist suggested he take out practicality all his teeth and replace them with dentures. He did and regretted it so much years later. 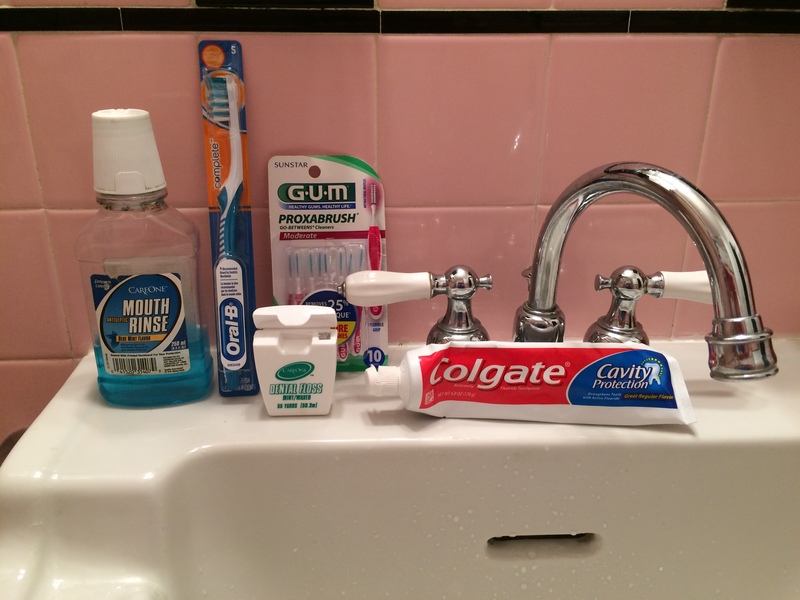 My two cents on dental health. Your dad’s dentist should be sued! What a great idea – Listen whilst you brush ‘n’ floss. I only really found out about Cab Calloway after he popped up in films like The Blues Brothers and The Cotton Club but his material is now a firm favourite of mine. Yeah, there’s a lot to be said for dancing in the house. In my case, doing it behind closed doors is the way to go, because I’m not exactly Fred Astaire! Ha ha – But you don’t need to be Fred, just enjoy it. Nothing like a little music to spice up the dental routine! Hi there. Right, music makes things better. Brushing, flossing, rinsing are so BORING. Lovely read! This piece would have been over-the-top perfect if you would have included a video clip of you moving to the groove of Memphis Train across your bathroom floor whilst flossing! 🤪😜. I nearly fell off my chair over the reference. What an unexpected delight. Thank you sir!!!! ❤️ P.S. I definitely need to spice up my evening ritual; It’s usually cedar flute music or a peaceful piano Max Richter piece. Hey, flute music can be very good. I’ll have to check out Max Richter. I forget what his music is like. Oral health is much more important than many people realise until it’s perhaps too late! Someone above mentioned “scrubbing,” it’s not necessary. Clean your teeth twice a day: before breakfast and before retiring for the night. Use a toothpaste containing the latest bioactive glass such as BioMin and you’ll keep sensitivity at bay, protect your gums, fight off acid erosion and stop early caries in its tracks. Check it out: https://www.biomin.co.uk/products/biomintm-f-toothpaste. We’re still working on our Spotify playlist! As a retired dental/surgical assistant may I congratulate you Neil on overcoming your periodontal disease. I hope that your overall health, as well as your mouth, thank you for your efforts every day. Hi Deb. I was lucky. My periodontist did a very good job. I enjoyed the music and also had the same dental problems you had. Sounds like both you and I neglected our gums and teeth when we were younger. Periodontal disease is no fun. Oh, gosh! You should have posted this for Halloween. I pretty much stay away from candy and other very sugary things these days. I used to drink lots of soda, and I’m sure that it contributed to the problems I had with gums and teeth. Mail? Check? Are those things really things? I seem to have a vague memory of something like them but it could be something I saw in a movie. Movie? Is that also a thing? I mean like before Netflix (as if there was a before Netflix). Hi. I know. The modern world evolves/changes really, really fast. Hi. I couldn’t read your article. The link didn’t work. Anyway, many thanks for visiting. As always, much appreciated. I was one of those kids who wore braces for years, so I take an interest in dental stuff. Here’s another link to the dental cafe, it’s about a 2 minute read. I want a handcrafted boar-bristle toothbrush! Have to say that you write beautifully and kept me captivated about the teeth. Oh, my. Sorry about the dental problems. I have a friend who has to see a dentist twice a month…. I’m getting so old that fillings I got in my teens have to be replaced with crowns but I guess I can’t complain. Cool music, thanks. Hey there, JT. Yeah, getting older can be full of surprises. Listening to peppy music does make chores (and I too consider flossing to be a necessary one) more bearable! I like your 3 choices, especially Pass the Gin. Did you know that the Meadowlarks also sang, as The Larks, the ’60s hit song Jerk? It’s another finger-snapper! You know more about that band than me! I’d never heard of them until the night I write about. I heard Pass The Gin on WRDV. You might like this station. Check out their website for more info. See you. Right. Periodontal disease is no joke. I’ve also had periodontal disease! I am now an avid flosser, which I’m ashamed to say wasn’t before, and things have cleared up for me as well. I also wear a night guard for my teeth because apparently some of my gum recession is from the intense presser of me clenching or grinding my teeth. Fascinating stuff, I know. I also very much appreciate the music. Love, love, LOVE St. James Infirmary especially. Thanks for that! Bravely posted. I, too, suffer. Two of my roots are apparently gone, according to x-rays; the other teeth are holding them in, I think. A child with too little space for their teeth would today have a couple removed, but back when I was young they didn’t take out healthy teeth – they were likely to fall out soon enough. Before I retired and moved out of London the hygienist (an hour every three months) was working towards sending me for root canal treatment. I couldn’t see how a mouth that tended to infection-related disease would become healthier by exposing it to more opportunity for infection. After I retired and moved to the sticks, my new NHS dentist was fairly basic (once a year with a quick scrape at the check-up), which suited me fine, but when he was replaced by another probationer at the practice, she was horrified at the state of my gums and signed me up for three sessions of what the hygienist used to do. My dentist was very pleased with me last week – she couldn’t believe how much my ‘pockets’ had shrunk (I think she meant the holes in my gums rather than the state of my wallet). And I’ve still got those two rootless teeth. Hi Cathy. You figured things out for yourself, with excellent results. I’ll have to do some reading about rinsing with oil. My dentist and periodontist and hygienists have mentioned all kinds of tips to me, but never mentioned that one. It;s Ayurvedic medicine – which isn’t normally mu cup of whisky… but having looked for reviews i didn’t read any that counselled against it and – like I mentioned above – it can’t do any damage. But sorry to hear about your tooth troubles. I have to get a couple of crowns and I’m not looking forward to that, but it pales in comparison to what you endured! You know, I use plain, original Colgate, the same one that has been on the market forever. I don’t want a toothpaste that has all kinds of whiteners and other additives in it. I like how you somehow managed to tie dental health with three YouTube songs. You’re the “Seinfeld” of the blogging world, Neil! I actually saw Cab Calloway perform, back in 1981. My brother and I were the youngest people in the audience. We saw him afterwards, at the hotel restaurant/bar, but I was too shy to talk to him. Wish I would’ve. Yeah, you can imagine the amazing stories he’d have told you. He must have led a very adventurous life. I think that genetics plays a big part in how healthy a person’s gums and teeth will be. You’re probably pretty resistant to the bacteria that in someone else would cause gum inflammation and periodontal disease. Anyway, keep on brushing! Oh my God! I’m going tomorrow to fix up my gums with tissue scraped from the top of my mouth. I am scared! But it sounds like you lived through it and I know I will too. And hopefully look better as an end result! Dental health should always remain a priority, I’ve learned that lesson. Cab Calloway is great! Love the song. Have a good week Neil. The song of Cab’s that I included in this article was recorded near the very start of his very long (about 60 years) professional career. Take care, Isabelle. Jerry, you have a very creative dentist. Watch out! Only you could create a narrative that arcs from dental health to meadowlarks, Neil. The only kind I know sing, too, but without accompaniment. I don’t think they floss, though. I still like them. Thanks for the thumbs-up, John. Appreciated. Cab Calloway’s ST. JAMES INFIRMARY was one of a few dozen of his old recordings in my collection until I recently sold my entire collection of 78 rpm records for reasons I won’t go into. I’m simply say that having to part with my decades-in-the-making collection was harder than having teeth pulled and gum disease repaired! I’m sorry to hear about your 78s. That stinks. I can relate to your pain . . . I have a large collection of vinyl albums. That collection means a whole, whole lot to me. I’d hate to part with it. Imagine dental health in the 18th or 19th centuries. Yuck! You’re not kidding. It wouldn’t surprise me if half the population was pretty much toothless by age 40. Oh, I can relate to your dental issues! My experience hasn’t been quite as bad as yours, but I’m also not done yet, so who knows, I may catch up. But the thing is, I have taken good care of my teeth, or at least I’ve tried. I honestly think genetics is a huge factor in what kind of teeth we end up with so please don’t be too hard on yourself. And I’m impressed with how bravely you dealt with the treatments! Hope you are all done with procedures…. Hey there, Ann. We’ve done our part in keeping the dental industry in business! Congrats on catching the periodontal disease just in time! Loved the last two selections, but couldn’t open The Memphis Train. Darn, it’s on my mind now, so off I go to YouTube! It sounds like you were in a further advanced state of periodontal disease which had to be dealt with (props!) but my dad, a dentist, says 90% of people get periodontal disease in some form. It’s evidently just part of being human. But it can obviously be held in check and not progress. So the dentist above who pulled all the man’s teeth out–criminal incompetence and/or greed !!! Hi. I just listened once again to Pass The Gin. Great song. It has a lot of kick, but in a relaxing sort of way. It might be good for Zen inducement. Have a great week, Stacey. See ya! Okay, just listened to Pass The Gin. You’re totally right. A little kick, but mellow kick. Very, very nice for Zen inducement. On top of which, of course, I wouldn’t mind if someone was passing me a huge glass of gin right now. Your post inspired me to do a post about the amazing flare-up of sciatica I’m going through. Yeah, pass the gin…OR ELSE. Thanks, Neil. Uh-oh. Sciatica is bad news. I’m sorry to hear about that. I hope it calms down very soon. Teeth are important we should take care of them properly. Thanks for reminding. Hopefully my regular appointments with my dentist, Dr Hurtin, are helping. I’ll have to suggest these tunes to him (while he has everything in mouth including the kitchen sink). He plays that music that doesn’t help the experience. Love the tunes. The Meadowlarks were new to me. One of my fave versions of St James is Armstrong and Teagarden. What kind of music does Dr. Hurtin play? Heavy metal? Industrial. Heavy on the jackhammer and power drills. Hi there. I know what you mean. It’s easy to not pay enough attention to the teeth. St. James Infirmary, by Cab Calloway–now that’s some mighty fine flossing music. My take-away from this post, Neil, is that while “Millions of top-notch recordings have faded away in music,” our teeth live on! And, hopefully, our gums too. Have an excellent weekend, Amy. Be seeing you. Have a terrific weekend, Jean. Be seeing you. Dentist are scary when you do not get annual checkups. Giving blood samples are less dangerous than a dental procedure. Going years without, lead to one’s teeth being scraped away. The drill is a murder weapon! We all need to keep our gums and teeth clean. Big problems can develop otherwise. Have a real good rest of the weekend, AOC. Many thanks, as always, for paying a visit to my humble website. Your humble website is so enjoyable and you have such a unique show of hospitality…that is so welcoming. Thanks for including Cab Calloway. Perfect for a Monday! He was terrific. See you! I could definitely clean my teeth to Pass The Gin! Thankyou for another introduction to great song 🙂 Hope your dental woes are now behind you. I never thought to brush my teeth with music before. Thanks for the idea! Thanks for posting! Have a wonderful day! Thanks for the edification… about dental health, music and late night boogie tunes… now, pass the mouthwash, won’t you? I’ll pass the mouthwash after I pass the gin!